Feeding Myths: Which Ones are Facts and Which Ones are Fiction? How many of these commonly heard feeding statements do you believe? Grains and concentrates can provide important nutrients, but the most important part of your horse’s diet (other than water of course!) is forage, such as hay or pasture. Forage provides the fibre needed to keep the horse’s digestive track healthy and helps a horse satisfy their natural “foraging” behaviour. But, hay and pasture can also make up a significant portion of your horse’s nutrient intake, particularly if they don’t have very high needs. Consider a typical 15.2 hh quarter horse, used lightly for trails and a weekly lesson or two. He probably weighs about 500kg and will have daily requirements of about 20 Mcal (Megacalorie) of energy, 700 grams of protein, 30 grams of calcium and 18 grams of phosphorus. The average grass hay will have about 2 mcal/kg of energy, 10% protein, 0.5% calcium and 0.24% phosphorus. So a horse eating 10kg of this hay (about 5-6 flakes per day, though this varies with flake size) would be consuming 20 mcal of energy, 1000 grams of protein (actually eating more than enough protein! ), 50 grams of calcium and 24 grams of phosphorus. Thus, these key nutrients are easily met with a relatively small amount of hay! He may need some additional vitamins and minerals through a supplement, but probably not much! Don’t underestimate your hay! 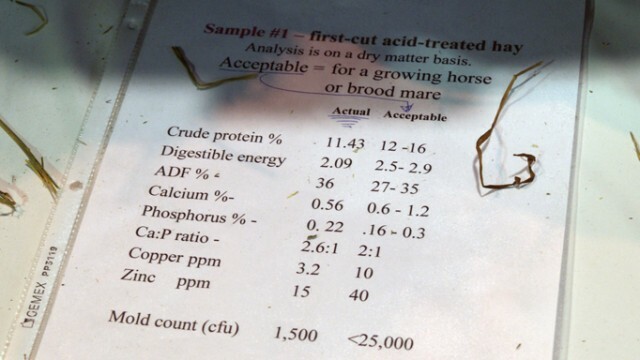 (Note: these values are straight from the National Research Council’s Nutrient Requirements of Horses, 2007 and from www.equi-analytical.com, a hay and feed analysis company that also posts average values for several hay and feed types). Actually, the $20-40 it costs to get your hay analyzed (it depends on where you have it done and how many nutrients you want examined) can save you money in the long run! If you knew the nutritional value of your hay you can more accurately balance your horse’s diet, and potentially determine that you don’t need much in the way of concentrate (see above), or that you may be able to purchase a feed with lower nutritional content at a lower cost if the bulk of the nutrients are already higher in the hay. It is especially useful if you plan to formulate your own diet from scratch (which can also save money – but be careful, because it needs to be done accurately). While this can be helpful in balancing your horse’s diet, the percentage of protein in a feed does very little on its own. You need to consider how much of a particular feed is going to be fed to determine what percentage is required. For example, which of the following diets would provide the most protein? They all provide the same amount: 320 grams! And may provide substantially different amounts of energy (calories) and other nutrients such as vitamins and minerals. The best plan of action is to first determine what nutrients are being met with your hay, then select the best concentrate based on your horse’s additional needs. 4. Feeding a higher protein feed to make your horse gain weight. 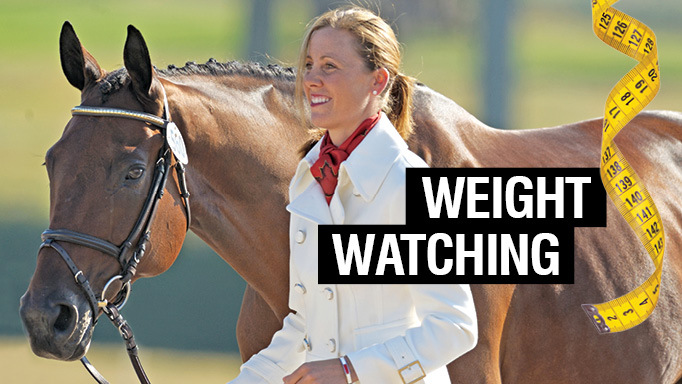 To gain weight as fat, your horse needs to take in more calories than he is expending. This can be accomplished in several ways; including increasing the amount of hay he eats or, perhaps more economically, providing him with a fat source like vegetable oil (highly concentrated calories). Protein is a very inefficient energy (calorie) source for the horse, and tends to be expensive. To gain weight as muscle, your horse will need to take in some additional protein to provide the building blocks for muscle development. However, upping the dietary protein alone is not enough (if it were, I can imagine we horse owners would all have more meat in our diets in hopes of achieving those abs of steel!). To build muscle, first there needs to be the exercise stimulus for muscle development, which only then needs to be supported by the dietary protein. And, because the horse is exercising, their calorie needs will be higher and they are probably going to need to eat more – and likely will be eating more protein anyway. This is a touchy subject. Many people prefer to have their horses on the fat side, particularly versus having them on the thin side. And in fact, many disciplines reward a little extra padding with ribbons, particularly in the halter ring. But, even horses that are slightly overweight are at higher risk for developing metabolic problems, including laminitis, and carrying around the extra weight may put more strain on joints, causing problems in the long run. The only group of horses that should ever be in the 6-7 range of the 1-9 Henneke body condition scale are broodmares. This is because research has shown that reproductive efficiency (the ability to get pregnant) is higher when mares are a little on the heavy side. The negative aspects of having them too heavy (>7) however, outweighs (pardon the pun!) the potential benefit in the breeding shed, so aim to keep them between a 6 and 7. Actually, the research is still undecided on this one. There appear to be pros and cons to either order. If you feed hay before grain, the idea is that the horse will be somewhat satiated, and may be less likely to wolf down his grain and potentially choke. And the saliva production induced by chewing the hay will help with digestion of the grain later on. But, other research suggests that if hay is fed before grain, the grain travels through the digestive tract more quickly, and may not be digested as well. In an ideal world however, a horse has been munching on free-choice hay or pasture continuously overnight or throughout the day, and thus when you do feed any grain meals, they aren’t on an empty (or ravenous) stomach. Round hay bales are perfectly suitable for horses! They just need to be good quality hay (free of mould and foreign objects) and ideally kept somewhat protected from the elements (especially if you only have a couple of horses and it takes a while to go through a round bale). In the winter in particular, there may not be adequate forage available under the snow, and if a horse is kept outside for several hours of the day, he will need to be provided with some hay for added nutrition, to satisfy that foraging behavior and to help keep them warm (hay digestion in the large intestine is actually done by fermentation, which gives off heat). Barn owners could toss hay flakes, but that can be labour intensive, not to mention more expensive. Round bales tend to be cheaper per unit weight than smaller square bales, so they can be very economical and practical. But, just like your square bales of hay, you should know what the quality is and purchase it from a reputable dealer. Actually – a horse should drink after exercise. Just don’t allow it to drink the whole bucket in one gulp. This myth arose from stories of horses either drinking too much too quickly (which could happen also if a horse were to go without water for a while and then was dehydrated and then offered water again suddenly) and having their stomach rupture because of the sudden large volume, or people offering too cold water to a too hot horse. I would avoid ice cold water, but offering small amounts of water to a horse after exercise is actually a good way to encourage it to rehydrate. In order for a horse to have healthy feet, it needs to be fed a balanced diet to provide all of its nutrient requirements. If these requirements aren’t being met, then yes, it is possible that the horse’s feet may be the first to “go”. And in these cases, nutritional supplements that contain elements found in the hoof will help, because they are meeting a deficiency. However, simply buying better quality feeds will also help correct this deficiency. 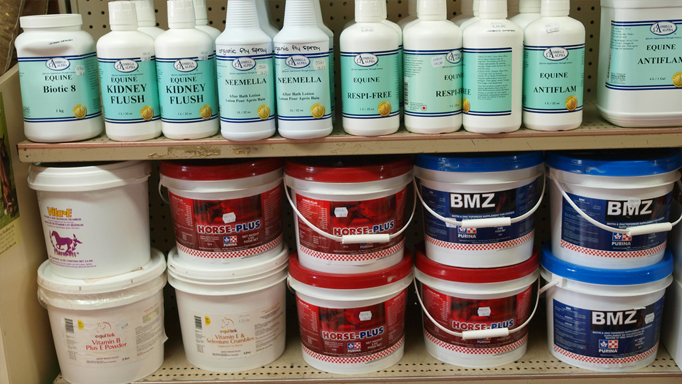 The only nutrient scientifically proven to help hoof integrity when supplemented in the diet is the B vitamin biotin. But research has also shown that biotin supplementation isn’t effective at improving hoof quality in all horses. Ah… if only it were so simple! If there were a nutritional supplement out there (that was legal) that could help animals lose weight don’t you think people would be using it too? Unfortunately, the only thing that can be done to lose weight is to expend more calories than are taken in – either through restricting calorie intake (so the calories burned come from energy stored as fat) or through burning more calories through exercise or both. And to add insult to injury, there appear to be some horses that are just “easy keepers” that have a hard time losing weight despite the best efforts of their owners. But despite it being trickier for some due to a slower metabolic rate, counting calories works. Work with your nutritionist and/or veterinarian to determine a safe but small amount of hay you can feed. Ideally, it should not be less than about 1.25% of their body weight, balanced with a vitamin/mineral supplement if needed. Some people discredit beet pulp as a filler, being too high in sugar and causing horses to choke. However, contrary to these beliefs, beet pulp can be an excellent feed to horses. Beet pulp can be found in forms covered with molasses, so it can be high in sugar. Therefore, it is generally suggested to look for a molasses-free beet pulp. Furthermore, if you have a horse that bolts his feed, or feed beet pulp pellets, it is a good idea to soak it before feeding to avoid the risk of choke. This may be a managerial problem for some, but worth the effort for most horses. As for beet pulp not having much nutritional value, that is also quite false. Beet pulp has decent amounts of protein (9%), moderate amount of digestible energy (about 2.7 mcal/kg, more than hay but less than most cereal grains), is high in fibre (18%) and typically low in starch (<2%) and sugar (about 10%). It does tend to have low phosphorus, but most hays (see above example) provide ample phosphorus. Beet pulp can be useful to add to a horse’s diet to safely increase the calories he’s eating (particularly if he won’t eat any more hay) and it is a good vehicle to hide things like supplements or oils in. It can also be useful for a horse on a limited diet (trying to lose weight) because of its relatively low energy density (compared to grain) and again, you can hide a vitamin/mineral supplement into it easily. Grass clippings are not ideal for horses, particularly in large amounts. Clusters of moist, fresh grass are primed for rapid fermentation in the digestive tract, which may trigger colic or laminitis. Furthermore, they may be prone to mould. And if the grass clippings are from your yard at home, there may be other plants in there that might not be good for horses. But, if you’ve mowed your pasture and have left some clumps (though they are likely pretty spread out), they probably aren’t going to be harmful. How to determine the ideal weight for your horse for health and soundness. 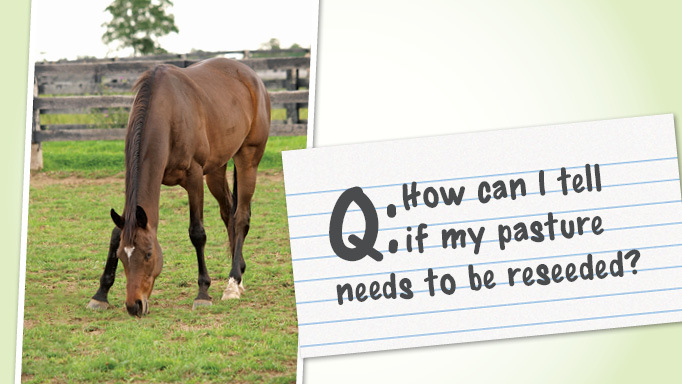 Learn how and when to rejuvenate your pasture safely. 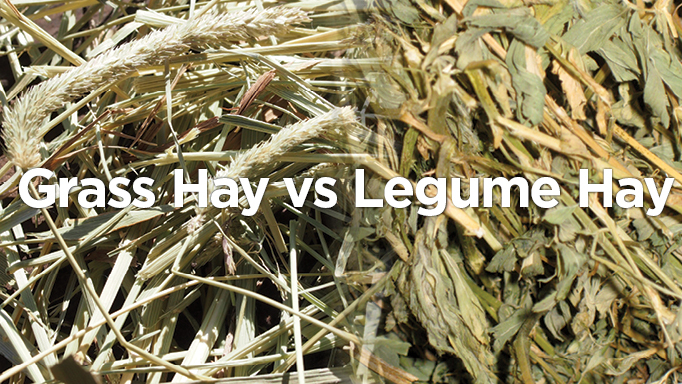 Grass vs legume hay – which one should you choose?